It's often rare that the common man gets to know of what happens in the household of a president. In the movie Lincoln, the family part of Abraham Lincoln has been handled in three separate parts. The relaitonship between Lincoln and his wife, Lincoln and his elder son and Lincoln and his younger son. Each of these three lines of relationships show the virtue that Lincoln carried as a familyman. While Lincoln is narrating about his nightmares to his wife, she is complaining about her persistent headache, yet, he consoles her that it shall get alright. She has so many qualms with Lincoln's presidential decisions and Lincoln manages to handle all of them with the ultimate grit. In fact the way his wife expresses her regrets for the way she had been during the tough times of Lincoln, itself shows how strong a man Lincoln was to forgive all that and just ask her to be happy. With the younger kid, Lincoln is the same old father who carries his kid on his back from floor to bed. He shows that a father needs to be with his kid while reading through the story books as well. He makes sure that the kid doesn't feel the void of his father just because his father is the President of USA. 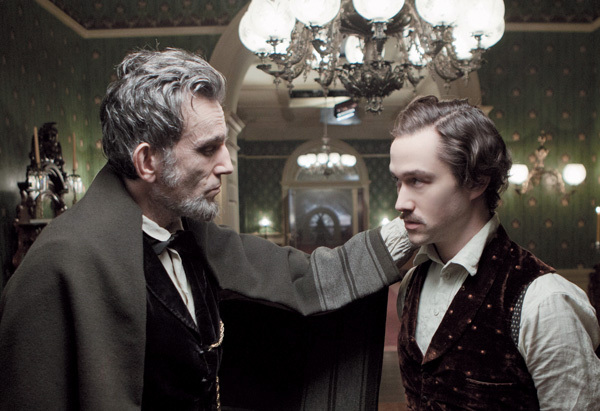 Almost throughout the movie we see that the younger son accompanies Lincoln in many places, be it office or home.